The Outsourcing Blog..."Horses for Sources": Is it time to dump the term "outsourcing"? 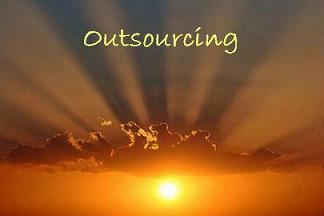 The Outsourcing Blog..."Horses for Sources"
Is it time to dump the term "outsourcing"? Having worked on a large number of "O" initiatives with enterprises over the last few years, the term outsourcing has given me nothing but problems. The minute the "O" word is uttered, staff get defensive, passions get stirred, resistance occurs. Often staff quickly brush up their CVs for a hasty exit before the axe falls. Staff and management tend to associate outsourcing with job losses, and their firms using low-cost labor from service providers. But what else can you use when you are looking to move into a multi-year engagement with third-party service provider, where you will use their staff, technology and processes and likely reduce your own inhouse overhead? I have experienced companies trying to disguise the fact they are outsourcing by labeling their service initiative as "out-tasking", "co-sourcing", "right-sizing", or even "resource-optimizing" (oh, there is more...). Peter Allen also chips in with his preferred term "services contracting". However you want to spin it, your staff will view it as outsourcing, and the more you try and disguise the taboo term, the more suspicious your staff will be that you are simply trying to ship them out for lower-cost labor. Personally, I prefer the term "managed services", as staff are not always transitioned out of the organization, and management responsibility for running the contracted services is transitioned over to the third-party provider. However, outsourcing has become ingrained in modern business vernacular, not dissimilar to information technology. It describes the activity a company goes through when it engages a third-party to take on the management of specific IT or business services on a long-term basis. However, I would stress that outsourcing these days describes the activity of evaluating and transitioning the processes and not normally the long-term management of them. For example, if a company decides to engage ADP to take on its payroll services, it will say "we're outsourcing our payroll to ADP". However, ask the same company how they run their payroll a couple of years later, and it will say "we use ADP for payroll". It won't say "we outsource our payroll to ADP". So all-in-all, if you are looking to outsource processes, be upfront with your staff and tell them you are looking at outsourcing opportunities. Explain they are a key part of making this outsourcing initiative successful and you need them onboard to support the initiative. It will be good for their career, and they will have the chance to take on new tasks that are more core the the business - for example vendor and service-level management and higher-level business activities that directly impact senior management decision-making. The more upfront you are with what you are doing, the more your key staff will appreciate the honest communication, and the more likely they will be supportive and proactive in making it work. If they still resist and try to derail the process, at least you know who the dissenters are and who may not be onboard the train once it has left the station.